Birmingham, AL October 23, 2018 — Emergent Rescue Systems, LLC today announced the release of a much anticipated product, the HRE (High Risk Entry) Pack. The original goal behind its creation was to fill a gap in carrier capability for treating junctional hemorrhage with current devices on the market. The resulting device, however, is far more expansive and covers and a much broader need than solely treating junctional hemorrhage. Ideally suited and engineered for M.A.R. (Massive Hemorrhage Airway Respiration) response, it can be maximized beyond full M.A.R.C.H. (M.A.R. Circulation Hypothermia) protocol. The pack has an extremely small footprint and thin profile, ideal as a CQC entry or confined space rescue bag. The 4-6 pre-staged tourniquets and 8+ hemostatic gauze packs can be accessed and used in seconds, making the HRE Pack an excellent active threat response bag. Combined with the internal design, the footprint and sling allow full access to all components without removing the pack, except those protected in the weather resistant Instruments/Meds/ Circulation compartment. The single shoulder sling, an important component of the pack, allows for rapid movement of the pack from rear to front and a detachable waist strap ensures stability during hasty movement. “We’ve put a great deal of thought and testing into the HRE Pack and the need for it remains high. 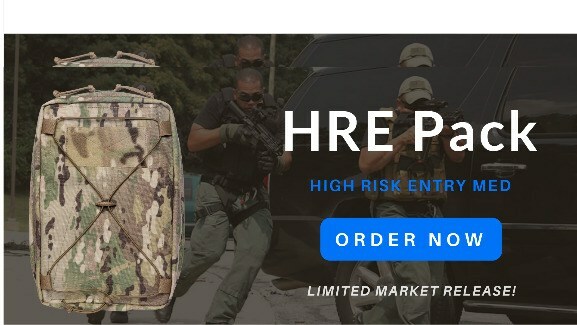 Contributions to its development from some of finest professionals in both operational medicine and industry have allowed us to bring the HRE Pack to market,” said Emergent Rescue Systems founder, Chris Richards. exceeds that criteria – without a doubt,” Coffee said. The HRE Pack’s first physical prototype was produced by Extreme Gear Labs, an industry brand name behind many successful high-end products. Zulu Nylon Gear completed the final designs and has partnered with Emergent Rescue Systems for full-scale production. capabilities for high risk threats in unpredictable environments. Birmingham, Alabama-based Emergent Rescue Systems, LLC specializes in hemorrhage control research, product development, and distribution. ERS currently markets products and services to law enforcement agencies, militaries and prehospital agencies in the United States. It was founded to serve U.S. law enforcement, hospital and pre-hospital markets, such as trauma centers, rural hospitals, fire and rescue, EMS, and various first responder units. For more information, visit emrescuesystems.com.